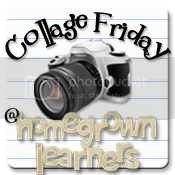 I love Collage Friday -- last week a record 21 homeschool bloggers shared their weeks here! This week marks the ninth edition of Collage Friday. I enjoy documenting our homeschool weeks this way. I'm thinking of doing something special for the TENTH EDITION next week - stay tuned! The week FLEW away from us. After a few busy weeks I designed this week so that we would just be at home each day. It allowed for a lot of creativity and free time. My favorite thing this week was learning about chivalry in The Story of the World. GMan has been "chivalrous" all week - opening doors and doing good deeds for "the ladies". It's very cute! Miss B has started making collages with her iTouch! She loves using Pic Collage. One afternoon she took a downed Bradford Pear branch and used it blossoms to decorate the swing set. We also learned you could buy a Sun Trust box seat for $20,000 a season. No big deal, right? The stadium is very close to my husband's office downtown, so he was able to join us. I think he's equally as obsessed about baseball as his son! A lot of time was spent with math each day. I found a great idea (via Pinterest) with graphing the area of a roll of the dice. We played this game several days, working to see who could fill up their paper first. It's a great game to reinforce the concept of area and review times tables. OH -- and have you seen LEGO GEOMETRY?? I just found this and we'll be trying it soon, too! I ordered some new grammar story books which the kids REALLY like. Easy Grammar is just getting to be DULL and I am questioning the validity of so much drill and repetition. We are making a little change for now. We also went to vote on Super Tuesday, and read a few books about voting. Each spring there is a piano competition called Federation. I always enter a group of my students, and Miss B has entered for the past four years through her own piano teacher. Federation is in just a week, and there has been A LOT of practicing in my house. My daughter is playing one piece that is particularly challenging to her - but she has risen to the occasion and it's sounding so good! I LOVE hearing her play piano - and I love that she enjoys spending time at the piano just for FUN. Our nature study this week was about the Bradford Pear. We found a downed branch on a nature walk and brought it home. After research and examination we learned that this tree is beautiful but STINKY. Basically, the blooms smell like rotting fish. We also learned this tree is native to China and Vietnam and was introduced to the US in 1963. As I mentioned before - lots of time was spent creating and outdoors this week. The kids love to be in the backyard listening to music, swinging, exploring our woods, and (recently) a certain little boy loves to practice his Samurai sword skills. I have a vantage from the deck and can watch them from the kitchen or while I'm reading a book - perfect. Finally - I wanted to share my sweet boy's heart with you. We have a friend at co op who had knee surgery yesterday. My daughter made her a beautiful card, and GMan included the entire 23rd Psalm, which he copied all by himself. ~ lots and lots of silent reading by my children - I detailed all of that here. ~ a day spent with horses and friends for Miss B - friends of ours from church just bought a farm not far from our house. Miss B spent an afternoon mucking stalls and WORKING. She loved it! ~ a new dishwasher (hooray!!) - my kids know what decibels are and how to price shop! ~ I am LOVING Plan to Eat -- if you haven't investigated this online meal planning, recipe importer, and list generator, PLEASE DO! (You can sign up for a month free trial, so why not?) I can't imagine planning our weekly meals without it. ~ a tea party in the co op class I help teach - it was a birthday party for a 14 year old girl. We all brought our favorite tea cup and home made goodies. ~ a baseball practice and a trip to the batting cages - opening day is Saturday! ~ me agonizing over whether or not to further investigate a classical homeschool (one day a week) program in our area. It has a fabulous reputation and is quite rigorous. I had been thinking this was the way to go with my children, but this week I think I'm finally at peace with the fact that I like designing their curriculum and still want to remain UNACCOUNTABLE to anyone else right now. I feel like we are on a good path, and that sense of WONDER is there in my children. How was your week? Feel free to link it up with a collage! Make sure to link back to this post in some way, and please visit some of the other bloggers on the list, too - we can gain so many ideas this way!